The University of Michigan, the University of New Hampshire, Colorado College and the California Institute of Technology have combined their scientific powers to shed new light on how global climate change will affect mammalian body size. Paleontologist and Professor of Earth and Environmental Sciences Philip Gingerich led the study. He and his colleagues shared their findings on November 1, 2013 in L.A. at the annual meeting of the Society of Vertebrate Paleontology. For years, scientists have known about a warming period known as the Paleocene-Eocene Thermal Maximum (PETM). 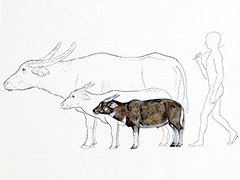 It was an extreme and arguably natural global warming event (called a hyperthermal) that occurred 55 million years ago, lasted about 160,000 years and caused the size of large animals like primates, horses and deer to shrink significantly. The team of universities concluded that smaller body size "seems to be a common evolutionary response" by mammals to extreme global warming events, "and thus may be a predictable natural response for some lineages to future global warming." Seems logical. But, the scary part is that we’ve made quite a dent in global climate change ourselves. How bad could it get, and just how small do we have to get, when the natural patterns of the Earth just happen to coincide with the fruits of our collective carbon footprint? Posted on November 11th under Global Warming Issues.